Filipino hard-hitting boxer Jaysever Abcede will travel to Japan to fight the undefeated Japanese Tsubasa Koura on July 29, 2017. Jaysever Abcede is a 22 years old fighter with a record consisting of 14W(9KO)-6L. He is a hard-hitting boxer and has a strong chin. Acebe fought the former world title challenger Vicha Phulaikaw in Thailand and he won the fight via 11th round KO. Jaysever Abcede is coming off a KO win over Charlie Cabilla last May and once fought Wanheng Menayothin last March but was defeated by 6th round unanimous decision. On the other hand, Tsubasa Koura is an undefeated boxer with a record of 10W with 7 KO's. 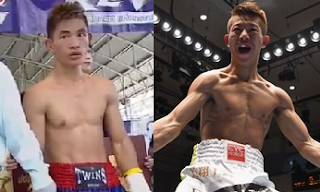 The Japanese fighter is also 22 years old and won his last 4 fights all by way of KO. Koura had fought the Filipino Jeffrey Galero and he just knocked out Galero in the 2nd round. Jaysever Abcede vs Tsubasa Koura will be held at Korakuen Hall, Tokyo, Japan.